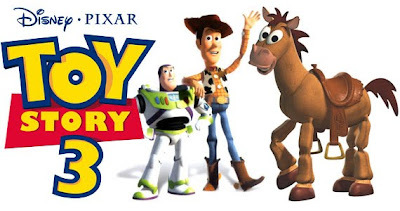 The Billionty-Oneth Geek: Toy Story 3: the best this year? Toy Story 3: the best this year? Yes, at least thus far. At the very least, this is my favourite movie this year as of publishing date. I'm convinced that if one day Pixar were to do live action movies, that they would succeed as much as their animated features. Why do I think that? Clearly, they excel at storytelling; animated or not, it's what makes or breaks a movie. And this is why I love Toy Story 3 so much — it tells a good story. The movie follows our favourite group of toys led once again by Woody as they struggle to survive the test of time. With each passing day is another moment they miss being played by or even noticed by their owner Andy, now heading off to college. After a freak mix-up, the group of toys, sans Woody, find themselves at a local daycare, which on the onset, appears to be akin to a retirement home for toys. But the truth is soon revealed and the toys find themselves ruled under a tyrannical stuffed bear who lock them up like prisoners. Can Woody save his friends from the greasy fingered toddlers and the mischief toys? What I love about this movie is how they were able to take the Toy Story brand and apply a different genre of cinema to it; that being the prison escape genre, probably more famous in yesteryear. And that they did it well is a testament to the story telling prowess of Pixar. The story is beautifully told, tugging at all your different emotional strings. Sometimes you'll fear, sometimes you'll (want to) cry, but most times, you'll laugh and have a good time. Before watching the movie, I heard that it was going to be a tear jerker, and while I can certainly see why people would shed tears, I don't think it hit the spot for me in that regard. That said, while the ending 'passing of the torch' scene was touching, for me, the most emotional scene was at the beginning of the movie and if you blinked, you probably missed it. And I don't know if it was meant to be emotional but it really hit me. It's one of the opening scenes when the toys are trying to figure out what's going on. Woody calls for a group meeting amongst the toys, but there's that stark realization that there's only 8 (I think) of them left. It just made me feel sad to know that during the time between Toy Story 2 and 3, that all those toys that were background toys were long gone, effectively "killed offscreen". For me, one of the things that sets Pixar apart from all the other animation studios is how they avoid going for the cheap laughs. Specifically, I mean how these animated movies can be filled with so much current pop cultural references sometimes. More specifically, I'm thinking of the Shrek series, which has been notorious for them. Look what happened to that series compared to the Toy Story series. It speaks for itself. In the long run, these movies date themselves when they're so inundated with these cheap tricks. I'm glad that Pixar has the foresight to veer off from that direction. I can't recommend this movie more enough. It is good and wholesome fun for the whole family. Like I said, at least so far, it's my favourite movie this year. Do yourself a favour if you haven't already, go watch this movie! Later geeks!